Great area, plenty of shops around like a 24/7 supermarket, bakeries, bike rental, tobacco shop, etc. Location is excellent and the apartment is gorgeous. Excellent host and welcoming was very friendly. We recommend 100%. The apartment was roomier than expected bearing in mind the reasonable cost and the central location. Maximum use was made of the space and the facilities were excellent. The location was particularly impressive as it gives you easy access to Barcelona and the bus and metro network. There were 5 of us that stayed (all adults) and yet we had more than enough space. Finally the view of Sagradia Familiar from the apartment was something well always remember. Excellent in all respects. Wonderful views of Sagrada Familia , metro across road , and lots of local eateries and bars. Would highly recommend. Location and view onto Sagrada Familia is incredible; as great as the pictures are, the real thing is even better. The flat itself is quite spacious for a couple, kitchen is well equipped, small balcony for two people great for sitting out to enjoy the view, decent kitchen and a washing machine make it a home away from home. Located a short half block away from two metro lines, two city sized supermarkets nearby (decent Bonpreu and a useful Carrefour Express), safe area and surprisingly quiet at night in spite of being next to a huge (literally and figuratively) attraction. A superb stay, highly recommended; the host was also great in terms of accessing the apartment and communication throughout when needed. The view of course is the first thing anyone would mention -it’s amazing. The apartment is great as well full of quirky character and the bathroom and kitchen are more than adequate. 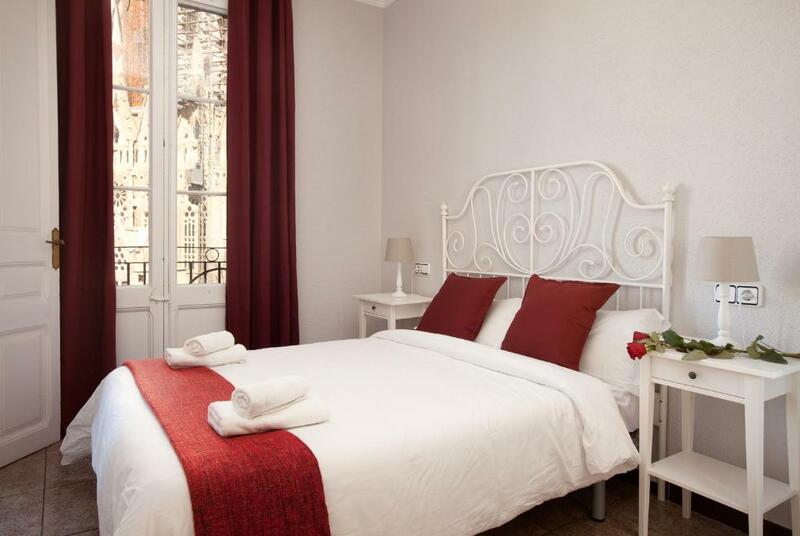 The apartment is lovely, well equipped and comfortable. But it's all about the view and location right opposite the Sagrada Famillia. 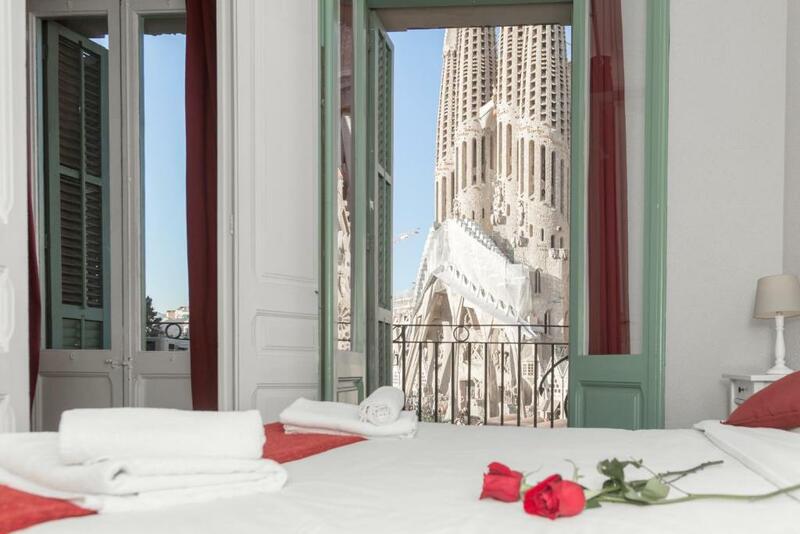 From the balconies, 2 of the bedrooms and lounge area you are looking directly at the Basillica. This apartment was perfect for my new hubby and I. It was large and spotless and very well kept. And the view! It was great sitting out on the balcony in the morning (with churros from a wee cafe down the stairs) and listening to the local parrots chirping in the trees. We will definitely come to Jose first when we return to Barcelona. Jose was very helpful and was only a phone call away when needed. This is a lovely property in a great central location. It was just the job for a family visit to Barcelona. Lock in a great price for Whatching Sagrada Familia – rated 9.4 by recent guests! Located opposite to Sagrada Familia, Watching Sagrada Familia is a self-catering accommodations in Barcelona. Cafeterias and tapas bars are 50 feet away. La Rambla and Plaça Catalunya are 1.2 mi away. 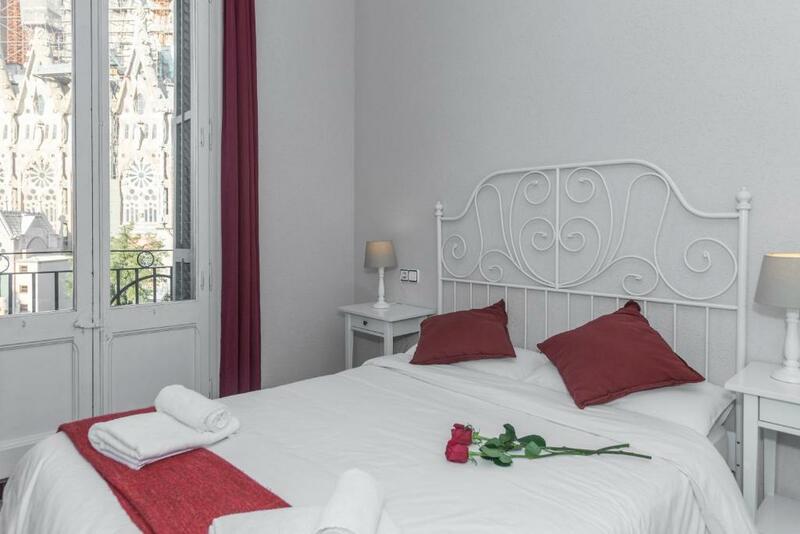 Featuring free WiFi, the air-conditioned apartment includes a balcony overlooking the city and Gaudi's Sagrada Familia. The seating area has a sofa and flat-screen TV. The kitchen is equipped with a stove, oven and microwave. The bathroom comes with a bath or shower. Camp Nou Stadium is 3.1 mi away. Barceloneta Beach and the port are 2.5 mi from Watching Sagrada Familia. Barcelona El Prat Airport is 8.1 mi away. 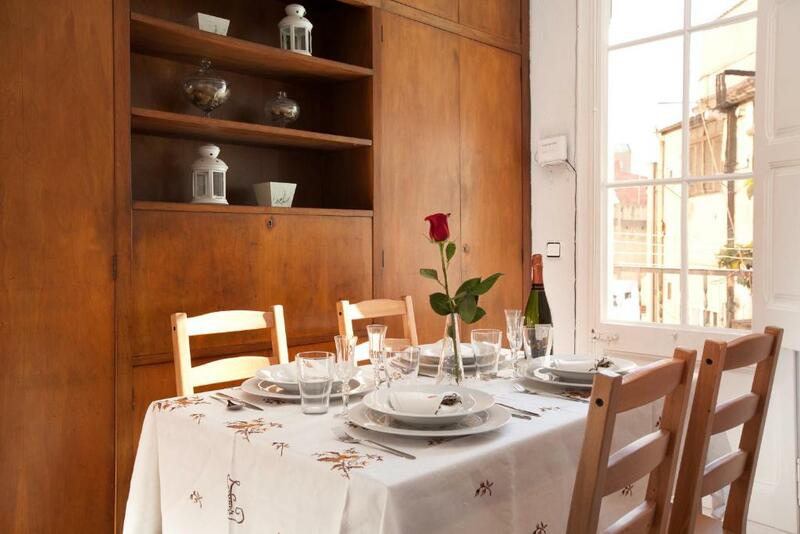 Eixample is a great choice for travelers interested in architecture, food and culture. Good for couples – they rated the facilities 9.5 for two-person stays. 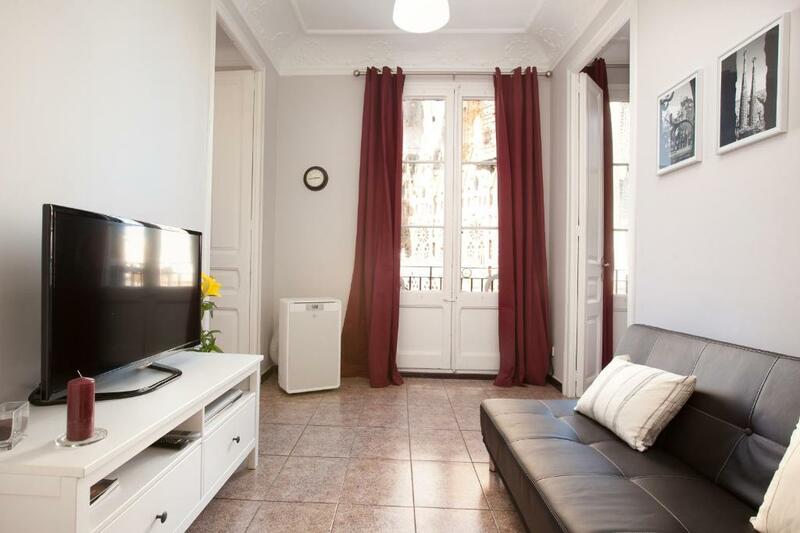 뀐 Located in the top-rated area in Barcelona, this property has an excellent location score of 9.8! 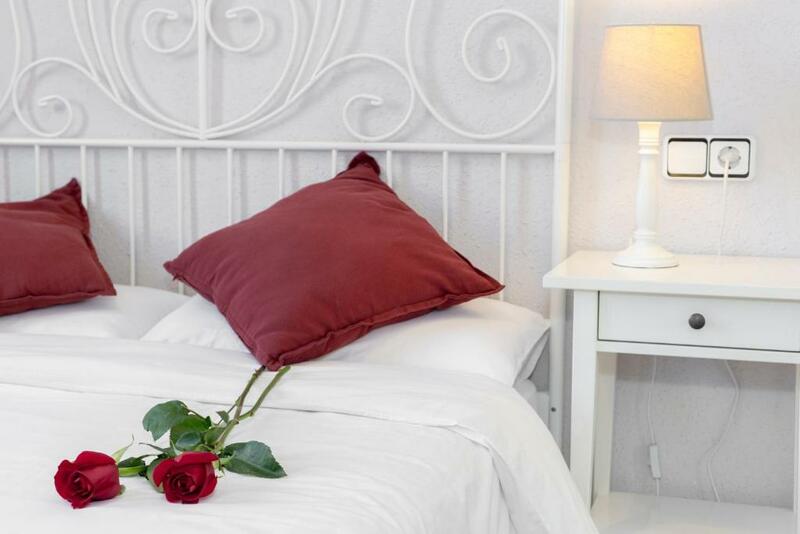 When would you like to stay at Whatching Sagrada Familia? Area Info – This neighborhood is a great choice for travelers interested in architecture, food and culture – Check location Excellent location – show map Guests loved walking around the neighborhood! House Rules Whatching Sagrada Familia takes special requests – add in the next step! A EUR200 damage deposit is required on arrival (around USD224.14). This deposit will be fully refunded 7 days after check-out, as long as there isn't any damage to the property. Whatching Sagrada Familia accepts these cards and reserves the right to temporarily hold an amount prior to arrival. A surcharge of EUR 30 will be charged for key collection between 20:00 and 24:00, and a surcharge of EUR 50 for key collection between 24:00 and 08:00. Late check-out is available under request and subject to availability. It carries a EUR 20 surcharge. Early check-in is available under request and subject to availability. It carries a EUR 20 surcharge. Please note that parties or events are not permitted at the property. Noise must also be kept to a minimum. Please note that the apartment and common areas must be kept clean. Christmas Eve, Christmas Day, St. Stephen's Day, New Year's Day and January 6 , property have a € 30 supplement . Please inform Whatching Sagrada Familia of your expected arrival time in advance. You can use the Special Requests box when booking, or contact the property directly using the contact details in your confirmation. A damage deposit of EUR 200 is required on arrival. That's about 224.14USD. This will be collected by credit card. You should be reimbursed within 7 days of check-out. Your deposit will be refunded in full by credit card, subject to an inspection of the property. Communication with the host was difficult at times, but we worked it out. The flat was perfect for a couple; it can sleep four additional people but in terms of living space (sitting room, shower, etc.) it would be a bit tight for a larger group (but certainly still possible). The meeting of the owner to collect the keys was not as smooth as I would have liked, a key safe would be a better option. No sugar or milk available and the instruction. Directions for use of the property could be perceived as rude maybe get a native English speaker to check it over for you. Nearby restaurants and shops have inflated tourist prices due to the location. Not enough toiletries - all in little satchet and insufficient for a family of 4 staying 3 nights! Excellent location near metro station. Fantastic view of Sagrada Familia. Thoughtful touches such as coffee pods for machine provided. Wifi was great. Owner could have a code for the door / key to avoid having to meet him on arrival. 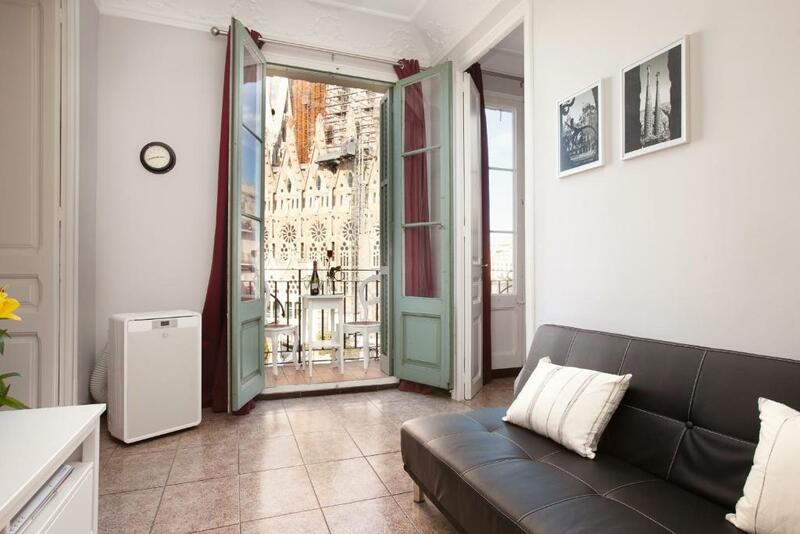 A beautiful apartment with stunning views of the Segrada Familia. The host was very friendly, helpful and accommodating after our very late night arrival and flight delays. One down side of the location is the noise from the street until late at night/early morning, at least on weekends, which may make it difficult to get to sleep. Also, note that the elevator may not be working and the apartment is up 3 flights of stairs. And the traditional style may not be to everyone's taste. Fantastic view of La Sagrada Familia. Good location; easy to get everywhere we wanted to go by foot - the Sagrada Familia was right across the street and any where else we went took between 15 to 40 minutes walking. Well maintained property and clean, exactly as described. Host was very friendly and responsive. We didn't like anything . It was perfect. The closeness to sagrada familia. The apartment was very clean and smelled lovely. It has a lift even if small.